Operator loads back frame, times transmission motor, loads on pallet, bar code scanner verifies correct variant, locks back frame on pallet, variant data is collected. Operator installs armrest bracket and torques to back frame, torque data is collected. 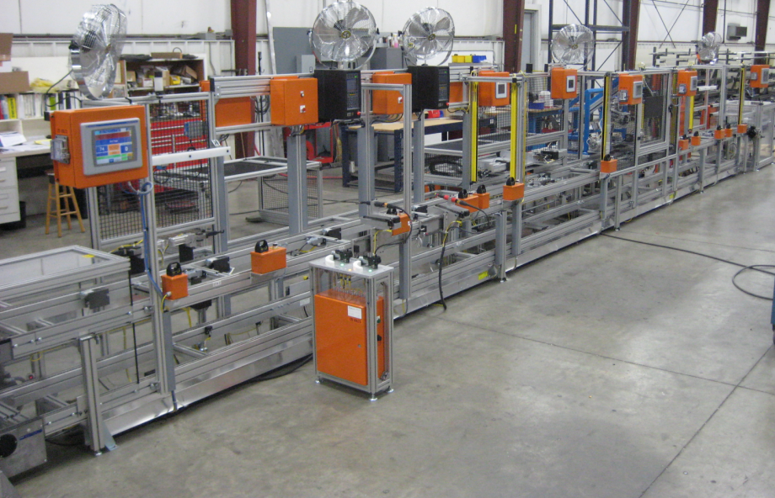 Automated station positions transmission tube, push nuts are auto-loaded, robotic pick & place installs push nuts into tooling, tooling advances installing the push nuts onto the transmission tube. Forces and dimensional data is collected. Automated station connects power to seat back, seat back functions to all positions, sensors verify position is met, seat back is set in shipping position, testing data is collected. Operator labels back frame, scanner verifies label and sends data from all stations to plant network, pallet unlocks, operators removes back frame and packs.